1- Sarri-ball has failed and fans know it. In 25 years of supporting Chelsea, I have never witnessed club fans turn on their manager. They’ve had occasional fractious relationships but never an out and out rebellion like we witnessed on Monday night. When your own fans chant, “you don’t know what you’re doing,” and join rival fans in singing, “you’ll be sacked in the morning,” it’s time to pack your bags. 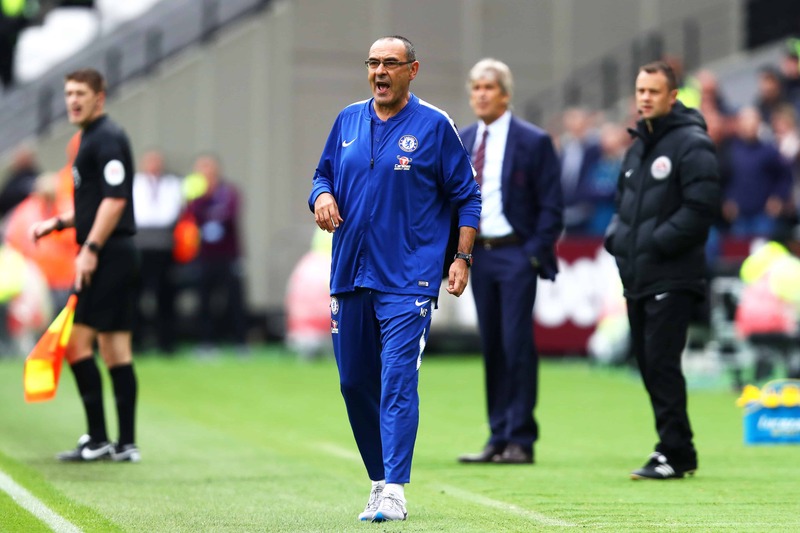 Sarri-ball might have worked in Italy where Juventus were Napoli’s only serious rivals, but it’s dead on arrival in the more intense, physically demanding Premier League. 2- Marcos Alonso is a not a left back. Chelsea’s worst run of results in half a decade – to my knowledge, this is the first time they’ve lost four consecutive games to Top Six rivals – has coincided with Marcos Alonso’s poor form. Truth be told, the Spaniard is struggling in the 4-3-3 because he is a wing back tailor made for a 3-4-3, or better still a 3-5-2 formation which provides for an extra central defender to cover space behind him. Alonso’s natural instincts are to attack, not defend. 3- Sarri has no Plan B, or Plan C.
Maurizio Sarri is caught between a rock and a hard place. His entire training regime has been geared towards making a 4-3-3 driven Sarri-ball work, but it has miserably failed. The only aspect of his system working is that Chelsea is bossing possession. His assistant Gianfranco Zola ought to advise adjust his prototype. Otherwise, his Plan A, which includes a crammed set of ineffective substitutes (William for Pedro + Ross Barkley for Mateo Kovacic), has backfired spectacularly. 4- Never transplant a system. As Pep Guardiola learned in his first season as Manchester City manager, it is suicidal to transplant a football system. What works in Italy; where the game is played at a slower pace, may not work in England. Sarri must pick a leaf from his Catalan friend who quickly dropped tiki-taka for a hybrid possession based game that relies on quick transitions and searing pace in the flanks. Sarri must stop being stubborn and start thinking outside the box, or else club owner Roman Abramovich will yield his dreaded axe. 5- Size matters in Premier League. Over reliance on pint sized technically gifted players is part of the reason Chelsea is losing to all and sundry in England. A run of results that includes losses to Tottenham Hotspur, Arsenal, Bournemouth and the two Manchester clubs was unfathomable under Jose Mourinho 1 (2004-7) because he always ensured his team could match rivals for physique, pace and sheer power. Nowadays Chelsea are among the five smallest sides in the EPL. Sarri ought to mind size next time he makes a foray into the transfer market.